Ready the cash-printing machines -- the world’s most sophisticated refineries are about to enjoy great times thanks to what might seem like a minor tweak in rules for the type of fuel ships consume. From 2020, vessels must buy fuel with less sulfur, or alternatively be fitted with equipment to curb emissions of the pollutant. One thing is clear: only a tiny fraction of the merchant fleet will have such gear when the rules enter force, since many shipowners argue it’s the responsibility of refineries to sell the right fuel. That’s fantastic news for complex plants, including some of the biggest on the U.S. Gulf Coast, in Europe and in Asia. Unlike simpler refineries, they can already make marine gasoil -- a distillate fuel similar to diesel that ships are going to need -- without churning out leftover, non-compliant fuel oil, according to Alan Gelder, vice president for refining, chemicals and oil markets at Wood Mackenzie Ltd. in London. The new sulfur standards, established by the International Maritime Organization in 2016, aim to cut the presence of a pollutant that has been blamed as a contributor to human health conditions like asthma and environmental damage like acid rain. Some shippers say that in an extreme scenario, the changes could upend world trade if the cost of compliance is too high. The existing global standard is generally 3.5 percent sulfur in fuel oil -- normally the residue when refineries make higher-value products like gasoline, diesel and jet fuel. The new IMO rules establish a 0.5 percent limit, encouraging refiners to make cleaner, compliant fuel to meet rising demand from the shipping industry. Plants that have greater flexibility on the types of crude that they process -- such as Reliance Industries Ltd.’s Jamnagar facility in India and those on the U.S. Gulf Coast -- will be among the top beneficiaries from the rule change, said Eugene Lindell, a senior analyst at JBC Energy GmbH in Vienna. More than 80 percent of U.S. Gulf Coast refineries have coking units that can create transport fuels from the residual fuel oil from heavy crude, according to research from Morningstar Inc. Reliance didn’t respond to a request for comment. As ships move away from high-sulfur fuel oil, they’ll increasingly favor distillate fuels like marine gasoil and other compliant fuels. That stands to benefit refiners who already produce a high ratio of distillates to dirty fuel oil. BP Plc is best-placed among Europe’s oil majors to benefit from the IMO rule change, analysts at JPMorgan Chase & Co., including Christyan Malek, said in a research note earlier this month. Distillates account for about 47 percent of the energy giant’s total fuels output, while high-sulfur fuel oil comprises about 3 percent, according to BP. In the European Union, the rule change will raise refining margins by an average of 60 cents, to $8.10 per barrel in 2020, JPMorgan said. Other companies are also set to benefit, according to the bank, which highlighted Finland’s Neste Oyj and Spain’s Repsol SA as having among the highest proportion of capacity at their facilities to avoid making fuel oil. “We are going to take advantage of this new margin in a significant way because our system is fully prepared to do that,” Repsol Chief Executive Officer Josu Miguel said during a Feb. 28 earnings call, adding that the company will “experience two, three, four good years” due to its refining capabilities. Fuel oil accounts for just 4-to-5 percent of production at Repsol, which has refineries in Spain and Peru, he said. The fuel shift is already starting to appear in futures prices. 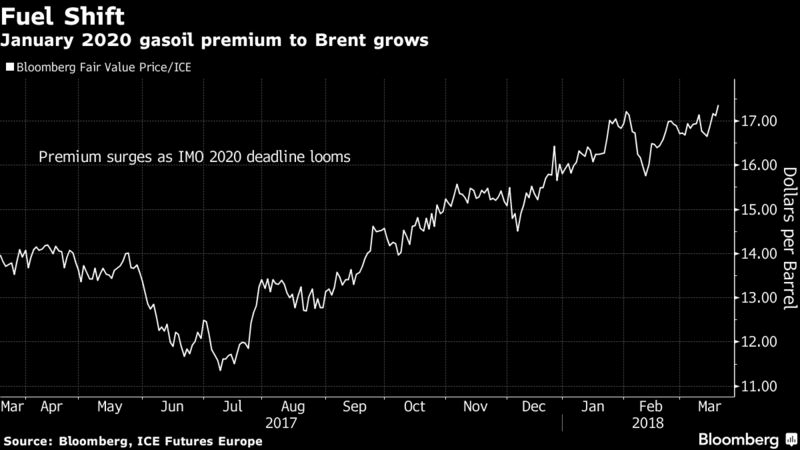 In Europe, the premium that low-sulfur fuel oil will attract over its dirtier counterpart in January 2020 has grown by 66 percent since the start of the year, according to fair value data compiled by Bloomberg. In Singapore, one of the world’s primary hubs for ship refueling, the premium of gasoil to crude in January 2020 has risen by 25 percent during the same time frame. For less-sophisticated refineries, the post-2020 world is less clear. “Some of the world’s simplest refineries will likely be forced to cut runs or close,” Energy Aspects Ltd. said in an emailed research note Wednesday. Production of high quantities of low-value fuel oil at some of Mexico’s state-owned coastal refineries “will pose a growing financial headache to the Mexican government and likely prove unsustainable,” the researcher said, noting that national oil companies often let money-losing plants stay in business. A few refineries that run medium sour crude from Saudi Arabia and don’t have coking capacity could be at risk, PBF Energy Inc. Chief Executive Officer Thomas Nimbley said at a conference in Houston earlier this month. Still, demand for marine gasoil will swell to 1.74 million barrels a day in 2020, the Paris-based International Energy Agency estimates, adding almost a million barrels a day of the fuel compared to this year. The surge in demand is expected to be matched by a spike in diesel prices, the agency said in a March 5 report. That should be good for simple plants in addition to complex facilities because margins will have to rise to make cleaner fuel from existing capacity, according to Steve Sawyer, head of refining at researcher Facts Global Energy. “Refinery utilization has to be very high to make the product base that we need,” he said.